The most acclaimed royal wedding of the moment was full of feminist details. Do you want to know about them? It is no secret that the Duchess of Sussex (Meghan Markle for most mortals) is a declared feminist. But declaring your cause by being a Hollywood actress is “relatively” simpler than being a feminist (and afro-descendant) upon entering the British royal family. Surely many people have wondered how she will manage to maintain her political convictions as a feminist woman and overcome the rigidity that a monarchy supposes. Well, Markle does not seem to be impressed by the actual protocols, both the current Duke of Sussex (Prince Harry) and she, have made real statements of intent at their wedding about how they want their marriage and who is and will be Meghan Markle within the British royal family. The first great feminist action that Markle has been the object of admiration on the part of many and many. Yes, we saw her walk alone to the altar since she got out of the bridal car until a few steps before Prince Carlos accompanied her, without the need for a patriarchal figure to deliver her as if it belonged to her. Meghan Markle is an independent woman, who has decided for herself to marry a prince and that was reflected from the moment she entered the Chapel of St. George at Windsor Castle. Perhaps his intention was to tell the world that he was not living a fairy tale, but a free and consensual love. As at the time did Diana of Wales and Kate Middleton Meghan Markle decided to ignore the traditional phrase of obedience to the male figure in the speech of the marriage vows. In addition, both said “I will” instead of “I do”, implying that the commitments that are acquired in marriage are not an obligation, but acts of love that are made in the future from a position of total freedom. His mother, Doria Ragland, is a divorced woman without a partner, so she decided to go to the ceremony alone. Why not? It is clear that she could have asked a cousin, brother or friend to accompany her, but perhaps she chose not to hide as an autonomous woman. After all, Meghan Markle’s mother is probably her best example to follow. In addition, before the ceremony, he accompanied Markle in the middle of the journey of the ceremonial car. An act that also has feminist overtones, as it is not common and shows the bond that unites this mother and daughter. One of the most emotional moments of the wedding and that surprised the guests and the whole world was the wonderful performance of the gospel choir ‘The Kingdom Choir’ at the ceremony, coming from the south-east of England. With this act, Markle alluded to his Afro-descendant roots in a forceful way, precisely because the gospel was born as a form of resistance to centuries of slavery in the United States, initiated with the colonization of the British Empire. But in addition, Markle relied on a choir directed by a woman, Karen Gibson, which demonstrates her strong commitment to feminism. It is well known that protocol rule in which the spouse who is not an heir must walk behind. 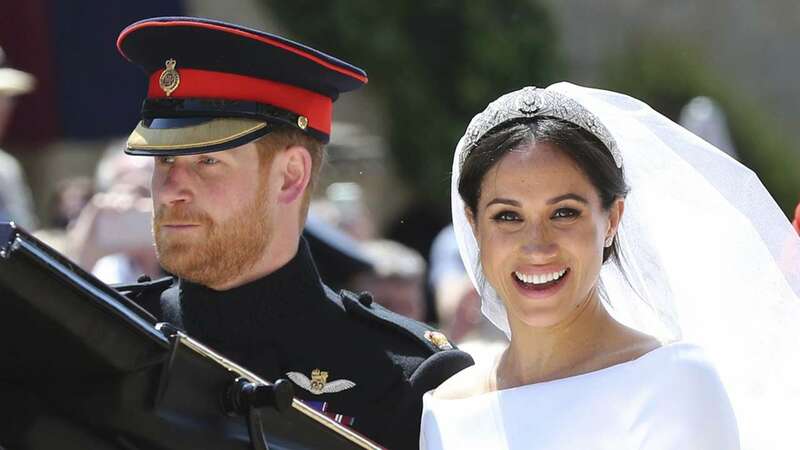 However, upon leaving the Church, Meghan Markle and Prince Harry decided to walk side by side down the stairs, as a sign of the kind of marriage they pretend to be. In fact, in the images, Prince Harry is very concerned about exactly matching the steps of Meghan Markle. Good for them! It is clear that although the vision of Meghan Markle was very present throughout the ceremony, the feminist actions of the wedding were agreed with Prince Harry because at a wedding two are married. In fact, the same Markle has declared that the Duke of Sussex also militates in the feminist cause. Is the Duke of Sussex one of those feminist men who is needed in these times? Maybe you have to wait a little while to see how your marriage works and how Meghan manages to get involved in the formal monarchical world. Because, we can not deny it, more than once we have seen fabulous fiancees among European royalty who at first seemed strong and autonomous women, but who ended up becoming the ‘wife of’, always walking ‘behind’ and, most disappointingly, ‘without a voice’. All this because the protocol demands it … A patriarchal protocol that perhaps it is time for monarchies to consider starting to change. Let’s hope that Meghan Markle is not one of the women we’ve seen disappear in the world of European royalty.